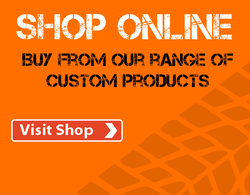 A comprehensive off the shelf product range at competitive prices, catering for all levels of motor sport. All products can be manufactured with different fittings or dimensions to suit your requirements. Fuel Tanks1 to 8 gallon. Can be manufactured with different fittings or to custom dimensions. Petrol Swirl Pots available with push fit and bolt up fittings, 1 or 1.5 litre, base or rear / bulkhead mount. Standard Dry Sump Tanks baffled for de-aeration and surge prevention. Vortex Dry Sump Tank THE ULTIMATE DRY SUMP TANK FOR DE-AERATION AND OIL SCAVENGE. Also available in cleanable and conical designs. Oil Catch Tanks capacities from ½ to 3 litres. Oil coolers air cooled and water cooled. Header tanks 1.5 litre, base or rear mount, horizontal or vertical designs. Water Swirl Pots various tank and pipe sizes. VW Splitscreen Bus Oil Cooler. High performance aluminium core, available with or without Spal fan. VW Splitscreen Bus Breather Box To be mounted inside engine bay roof. Head & case breather fittings, drain & baffled tank breathers. The Concept Racing 7 Gallon Mini Fuel Tank Fits into the spare wheel well of the historic Mini, available with Sight Gauge or VDO Sender Flange, Straps and Foam Fitting Kit. (VDO Sender Unit available to purchase separately). Our Mini Tanks can be manufactured with different fittings including a fuel injection return. This Replica Audi Quattro Dry Sump Tank is an exact copy of an original Sport Quattro S1, (1985) Oil Tank. Concept Racing’s high quality, hand made Intercoolers and Chargecoolers use lightweight, efficient cores and can be manufactured from your original sample intercooler, template or simply send us your drawing / sketch. Intercoolers can be made to almost any size and shape, with whatever tube sizes, fittings and mounts required. 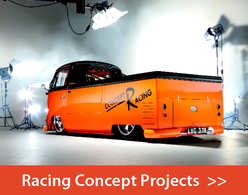 At Concept Racing we specialise in Bespoke Fabrications. We manufacture a wide range of parts from pattern, drawing, photograph and cardboard box mock up as well as working on cars brought “in house”.